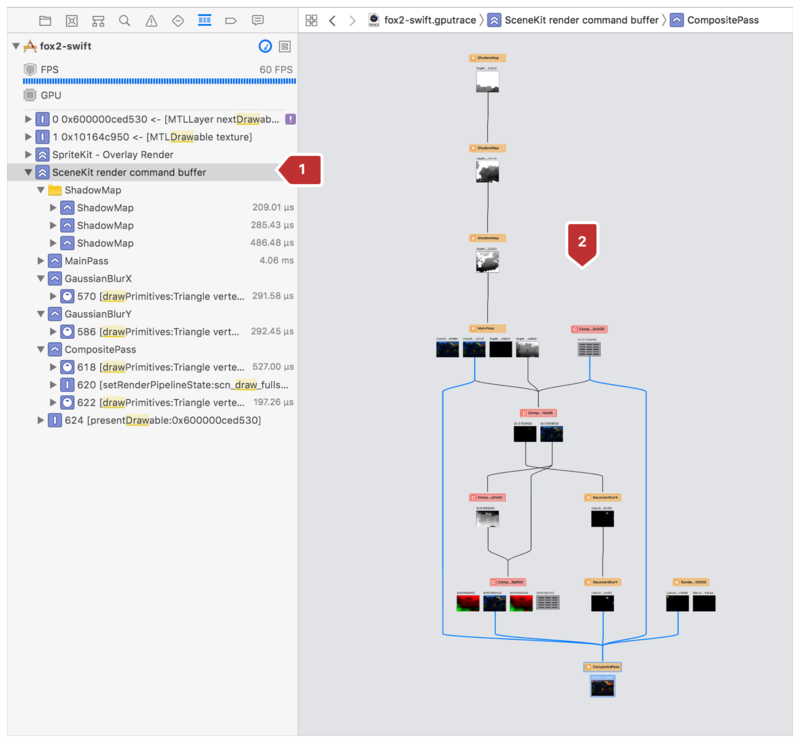 View your render passes as a flow chart and inspect individual resource dependencies to understand which commands wait on others to complete. To support Metal's multipass rendering system, use the dependency viewer to analyze frame calls and inspect your app's render passes. The dependency viewer provides a graph-based alternative to viewing your frame's instructions with the call list. Being a tree-based graph, the dependency viewer enables you to easily spot discrepancies in resource contention or identify extraneous render passes. Access the dependency viewer within a captured Metal frame. Most commonly, you capture a Metal frame by clicking the camera button on Xcode's debug bar as covered in Performing a GPU Capture from the Debug Bar. For more ways to capture a Metal frame, see Metal GPU Capture. Choose View Frame By Call. Select your command buffer in the call list. Observe the dependency viewer in Xcode's center pane. 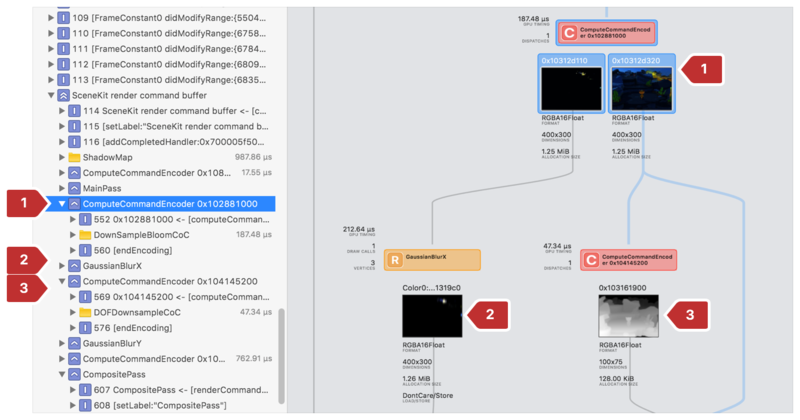 Use the dependency viewer to validate your app's render passes as a structured hierarchical flowchart. Because the dependency viewer can easily show multiple dependencies, it provides more information than viewing your frame in the call list alone. See its corresponding entry selected automatically in the call list at left. Visually check your render passes for completeness and conciseness. One of the benefits of the dependency viewer's visual layout is the ability to easily identify redundant or extraneous render passes that could otherwise go unnoticed in the code or call list. See your first render passes at the top of the graph, and subsequent render passes flowing downward chronologically. For each pass in the graph, the layout, lines, and connections indicate dependencies. A pass whose line flows up to another render pass is one that depends on the completion of that pass before it can be scheduled for execution. Use Xcode tools or Metal API to capture a runtime snapshot of your app's Metal commands and state.